The double block on E. Green Lake Way North between Latona and Sunnyside Streets was developed in the early 1900s with the typical late-Victorian Seattle homes shown here. Most of these homes survive. 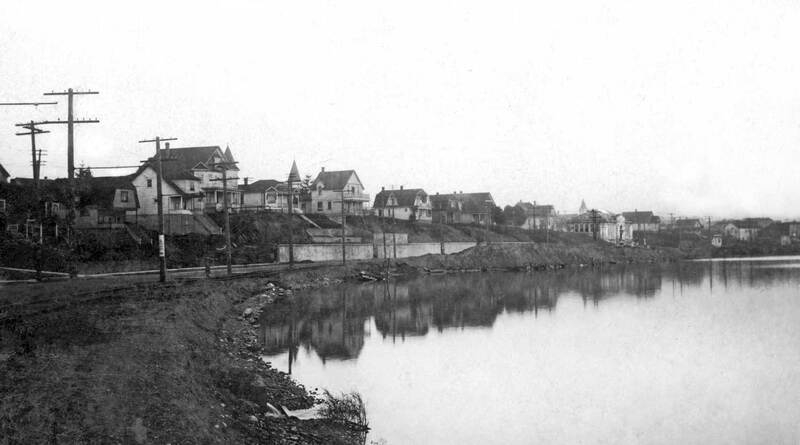 When Green Lake was lowered in 1911 the exposed lake bed was developed as verdant park land. Most of the homes showing in the historical view were built in the first years of the 20th Century — Green Lake’s boom years. It is a double block extending between Latona and Sunnyside Streets. With three exceptions these homes survive, although most have had lots of changes. For instance, the big house on the left at 7438 E. Green Lake Way North is here nearly new. Built in 1908 it has by now lost its tower, but gained much else. (But you’ll have to visit the sidewalk beyond the park trees to inspect these additions for yourself.) The missing homes have been replaced with a row of three non-descript multi-unit boxes. At least from this perspective, for these the park landscape is an effective screen. One of Green Lake’s principal early developers, W.D. Wood, proposed to the city in the early 1890s that they acquire the lake’s waterfront for a surrounding park. Had the city followed Wood’s advice there would have been no need to lower the lake and so dry up the stream that ran from its east side to Lake Washington. Nor of course would the homes we see here have been built on park land. Wood, a man of ideas and initiative, was later elected Mayor of Seattle in time to resign and join the Yukon gold rush n 1897.